Home is where our heart belongs and home is where we long to be. 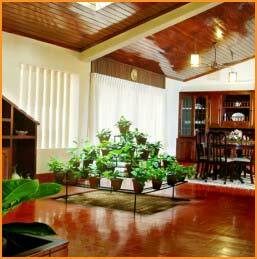 Welcome to Kumarakom Homes. The home of Sojan & Mercy Kizakkethalackal, who are also the owners of Kumarakom Restaurant, located across five prime locations in Chennai. Today this vivacious and enterprising couple has decided to open their home to you and your guests as well. Pamper your guests whether relatives or friends with a veritable 'Home away from Home' experience... an assurance to all the guests, be it the 'Marunadan Malayalee' or your own kith and kin residing in various parts of the country. You can choose to celebrate any occasion, may be your daughter or son's wedding, your grandchild's naming ceremony, your parents wedding anniversary, a deputation, or just a retreat from the dust and din of the large cities. This home is a perfect getaway for vacationers and a perfect hideaway for the thinker, philosopher and artist in you. "The Kumarakom Homes" is a perfect and cost saving alternative for tourists visiting kumarakom lake and bird sanctuary which is merely 12 kms away. Please note that Booking guarantees the reservation of the entire house along with its premises to a single party and will not be shared by other clients at any point of time. Reservation of individual rooms or a part of the house will not be permitted. Cook on call if the guests stay for a minimum of 15 days.